Guardians of the Galaxy Vol. 2 Wraps Production! 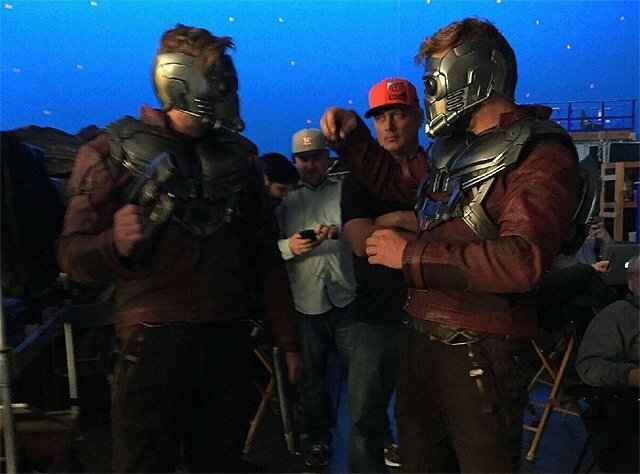 Yesterday, star Chris Pratt wrapped his reprisal of Star Lord in Guardians of the Galaxy Vol. 2, and later that day director James Gunn took to Twitter to announce that principal photography on the Marvel Studios sequel has officially wrapped after several months at Pinewood Studios in Atlanta, Georgia. Those attending Comic-Con festivities in San Diego next month can look for Gunn, Pratt and more to take the Hall H stage, likely with cool new footage, but in the meantime fans can tide themselves over with a new look at Pratt (via Instagram) and his stunt-man Tony McFarr on set in the gallery below! And that’s a wrap on #GoTGVol2. WHEW. So much gratitude to my wonderful cast and crew. Thank you all. The Guardians of the Galaxy Vol. 2 cast also includes the return of Zoe Saldana (Guardians of the Galaxy, Star Trek Into Darkness) as Gamora; Dave Bautista (SPECTRE, Guardians of the Galaxy) as Drax; Vin Diesel (Guardians of the Galaxy, Furious 7) as the voice of Groot; Bradley Cooper (Joy, American Sniper) as the voice of Rocket; Michael Rooker (Guardians of the Galaxy, Jumper) as Yondu; Karen Gillan (Guardians of the Galaxy, The Big Short) as Nebula; and Sean Gunn (Guardians of the Galaxy, “Gilmore Girls”) as Kraglin. New cast members include Pom Klementieff (Oldboy), who plays Mantis, Elizabeth Debicki (The Great Gatsby, Everest), Chris Sullivan (“The Knick,” The Drop) and Kurt Russell (The Hateful Eight, Furious 7). Guardians of the Galaxy Vol. 2 is produced by Marvel Studios’ president, Kevin Feige, with Louis D’Esposito, Victoria Alonso, Jonathan Schwartz, Nik Korda and Stan Lee serving as executive producers. Look for it to hit the big screen May 5, 2017 and be sure to check back with us next month for a full report on the Guardians 2 Comic-Con presentation.